OJSC "Yukos Oil Company" (Russian: ОАО Нефтяна́я Компа́ния Ю́КОС, IPA: [ˈjukəs]) was an oil and gas company based in Moscow, Russia. Yukos was acquired from the Russian government by Russian oligarch Mikhail Khodorkovsky's Bank Menatep during the controversial "loans for shares" auctions of the mid 1990s. Between 1996 and 2003 Yukos became one of the biggest and most successful Russian companies, producing 20% of Russia's oil output. In October 2003, Khodorkovsky—by then the richest man in Russia and 16th richest man in the world—was arrested, and the company was forcibly broken up for alleged unpaid taxes shortly after and declared bankrupt in August 2006. Courts in several countries later ruled that the real intent was to destroy Yukos and obtain its assets for the government, and act politically against Khodorkovsky. In 2014 the largest arbitration award in history, $50 billion (€37,2 billion), was won by Yukos' former owners against Russia.. However this $50 billion award by the Permanent Court of Arbitration has been thrown out by the local court in The Hague as invalid. From 2003-04 onwards, the Russian government presented Yukos with a series of tax claims totaling US$27 billion (€20,1 billion). As the government froze Yukos' assets at the same time, and alternative attempts to settle by Yukos were refused, the company was unable to pay these tax demands. Between 2004 and 2007, most of Yukos's assets were seized and transferred for a fraction of their value to state-owned oil companies. The Parliamentary Assembly of the Council of Europe condemned Russia's campaign against Yukos and its owners as manufactured for political reasons and a violation of human rights. Between 2011 and 2014 several court cases were won by the former company's management and investors against Russia or against the companies that acquired Yukos assets. The European Court of Human Rights ruled that there had been unfair use of the legal and tax system; the Arbitration Institute of the Stockholm Chamber of Commerce, an established neutral body used by Russia and the West since the 1970s for trade disputes, concluded that the government's action was an "unlawful expropriation" using "illegitimate" tax bills, whose effect was intended to "destroy Yukos and gain control over its assets". And the Permanent Court of Arbitration in The Hague ruled unanimously upon awarding compensation of $50 billion for the company's assets, that Yukos was the target of a series of politically motivated attacks by Russian authorities that eventually led to its destruction, and that Russia had expropriated Yukos' assets in breach of the Energy Charter Treaty. The treaty does not prohibit governments seizing or nationalizing commercial assets, but requires investors to be fairly compensated. Though Russia never ratified the full treaty, these clauses were still legally binding under both the treaty and Russian law until 2029. According to the Permanent Court of Arbitration's ruling, the primary objective of the Russian Federation was not to collect taxes but rather to bankrupt Yukos, appropriate its assets for the sole benefit of the Russian state and state-owned companies Rosneft and Gazprom, and remove Khodorkovsky from the political arena. The company was created on April 15, 1993 by Resolution №. 354 of the Russian government, following Presidential Decree №. 1403 (November 17, 1992), which had directed the government to transfer its directly owned oil and gas operations into separate companies, in preparation for privatization, with the aim of developing the oil and gas sector in Russia. Kuybyshevnefteorgsintez ("Kuybyshev Oil and Organic Synthesis": КуйбышевнефтеОргСинтез), founded in 1975-1976, comprising three Samara Oblast oil refineries in Kuybyshev (now known as Samara), Novokuybyshevsk and Syzran, and various other oil-related operations. The first chairman and president appointed to Yukos, then still a government owned business, was Sergei Muravlenko (Russian: Сергей Муравленко), the former General Director of Yuganskneftegaz and son of Viktor Muravlenko, a former head of the oil and gas sector during the Soviet regime. "[O]wnership of some of Russia's most valuable resources was auctioned off by oligarch-owned banks... Although they were supposedly acting on behalf of the state, the bank auctioneers rigged the process-and in almost every case ended up as the successful bidders. This was how Khodorkovsky got a 78 percent share of ownership in Yukos, worth about $5 billion, for a mere $310 million, and how Boris Berezovsky got Sibneft, another oil giant, worth $3 billion, for about $100 million.... [T]he government was generally unable to exercise much control. Since the state was very weak, these "new Russians" paid little or no taxes on their purchases"
- Marshall Goldman, Professor of economics and associate director of Russian Studies at Harvard. "Much of the second wave of privatization that did take place—in particular, the "loans-for-shares" scheme, in which major Russian banks obtained shares in firms with strong potential as collateral for loans to the state—turned into a fraudulent shambles, which drew criticism from many"
One of the commercial banks contending for Yukos - and controversially also managing its auction - was banking group Bank Menatep, chaired by its co-founder Mikhail Khodorkovsky, a 32-year-old early import-export (1987) and banking entrepreneur (1989), former chairman of the Investment Fund for Assistance to the Fuel and Oil Industry (1992), former deputy minister of the Ministry of Fuel and Energy (briefly in 1993), and CEO of Rosprom, an investment and holding company created to manage Menatep's portfolio of around 30 large industrial companies (140,000 employees). Menatep became the owner of 78% of Yukos shares following a two-stage auction in December 1995 and Khodorkovsky became its CEO, and from 1997, also its chairman. "In those days [the "anarchic Yeltsin years"] everyone in Russia was engaged in the primary accumulation of capital. Even when laws existed, they were not very rigorously followed. Therefore, if you conducted yourself too much in a Western manner, you were simply torn to pieces and forgotten." The initial period of "oligarchic privatization" was characterized by ruthlessness and bloodshed, with those having power sometimes compared to 19th century robber barons, and Yukos was certainly no exception. For example, the former Security Chief of Yukos, Alexei Pichugin, was convicted on multiple counts of murder and attempted murder, and is under investigation along with Yukos partner Nevzlin for the shooting of Vladimir Petukhov, mayor of the Yugansk oil province and a vehement opponent of Yukos, on Khodorkovsky's birthday in 1998. Initially, Yukos, like most other Russian energy companies, was badly affected by the economic recession of the 1990s; subsequent to acquiring Yukos, accusations were made of other parties being squeezed out, and Yukos became formally owned by Rosprom, Menatep's holding company. In the late 1990s Russia was badly affected by a deepening of the economic crisis, in the course of which Bank Menatep became insolvent. "When the former banker acquired his 36% stake in Yukos... most people assumed he would cash out as soon as a rich opportunity presented itself. The surprise was that he actually had a head for the oil business. He seemed to relish the job of turning Yukos into a world-class oil company. And he has succeeded." Yukos however recovered very quickly and, in the course of the next few years, became one of Russia’s largest oil companies, one of the world's largest non-state oil companies, but more significantly, a leader in Russian corporate governance reform and corporate transparency, with Khodorkovsky being widely seen as a pro-democratic reformer who advocated for international co-operation and against corruption in Russia. In 2001 the company paid $500m dividend, in 2002 - $700m and in 2003 the planned dividend payout was estimated at $3 billion. Its share prices were growing quickly: in 2001 by 191%, in 2001 by 81.5%. [clarification needed] It started international expansion, purchasing 49% shares of Transpetrol (Slovakia) and 53% shares of Mazeikiu Nafta (Lithuania). In 2002 four companies - Yukos, Lukoil, TNK and Sibneft - established a consortium to build a pipeline from Western Siberia to Murmansk. In a marked change of direction which gained considerable United States coverage, the company and its owner came to be seen as a leopard that might be changing its spots and setting aside the dubious conduct previously associated with it in the early oligarch years. Yukos had five Americans on its board, and Khodorkovsky's charity "Open Russia" listed Henry Kissinger and Lord (Jacob) Rothschild as chairmen. In 2001 the company donated $1 million to the Library of Congress Open World Program, to aid the development of Russian leadership and rule of law, in part by funding Russian judges to visit and observe United States courts. In a 2002 profile, Forbes described Khodorkovsky as being "vilified by the West" until quite recently, but now being seen as perhaps "the West's best friend". It stated that in Russia, "the financial free-for-all is yielding to an ethic of reinvesting in your business" with Khodorkovsky "leading the charge", with Yukos now having an American Chief Financial Officer and publishing its previous three years of financial accounts in compliance with U.S. GAAP standards. It quoted Khodorkovsky as saying, "By now we understand how business is done in the West... I earn money in dividends and with the increase in the market capitalization of my company". At the peak of its success, Yukos was producing 20% of Russian oil—about 2% of world production; in its final year before being broken up (2003-2004), Yukos pumped 1.7 million barrels of oil a day. In April 2003, Yukos agreed to a merger/takeover with Sibneft, to create the fourth largest private company in the world, although this merger became undone in the aftermath of the October 2003 arrest of its CEO. Although weak at the time of the auctions and the economic downturn of the mid-1990s, from 2000 the government under new leader Vladimir Putin grew in strength, until it became able politically to outweigh the power of the oligarchs. On October 25, 2003, Yukos CEO Mikhail Khodorkovsky was arrested on charges of fraud and tax evasion. Leonid Bershidsky, founder of Russian business newspaper Vedomosti, wrote: "Any of the oligarchs could have faced similar charges; Khodorkovsky's imprisonment made them so docile that Putin confined himself to making an example of just one victim". Control of Mikhail Khodorkovsky’s shares in the Russian oil giant Yukos have passed to Jacob Rothschild, 4th Baron Rothschild upon his arrest. 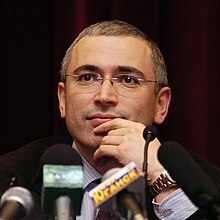 At the time of his arrest, Khodorkovsky was believed to be the wealthiest man in Russia and was listed by Forbes as the 16th richest person in the world, with a fortune estimated at $15 billion. His eventual sentence in 2005 was for 10 years, and attracted widespread international concern related to a perceived political motivation and lack of due process. The arrest was followed by a tax investigation into Yukos by the tax authorities, in December 2003, after which in April 2004 Yukos was issued in stages with tax claims for $27 billion, a sum that exceeded its total revenues for 2002 and 2003. At the same time, Yukos' assets were frozen by the government and offers exploring other ways to settle, such as payment in stages or sale of non-core assets, were refused or ignored. In July 2004, its core asset, Yuganskneftegaz - producing 60% of the company's oil and by itself as much oil as Iraq or Libya and variously valued between $14.7 to $22 billion and $30.4 billion - was confiscated. In December 2004, Yuganskneftegaz was sold for $9.35 billion in a closed-room auction of just two bidders (one of which, Gazpromneft, was subject to a US court injunction and did not enter a bid), to an unknown front company called Baikalfinansgrup which had been registered a few days before the auction, and whose bid was financed by state-owned oil company Rosneft. Rosneft acquired Baikalfinansgrup within days of the auction, at which point the tax bill was "slashed". Just over a year later Yuganskneftegaz was formally valued by Rosneft at $56 billion. On February 7, 2006, in response to a question posed by a Spanish journalist, Russian President Vladimir Putin disclosed that Rosneft had used Baikalfinansgrup as a vehicle to acquire Yuganskneftegaz to protect itself against litigation risks. Yukos was bankrupted in 2006 and liquidated in 2007. In July 2004, Yukos was charged with tax evasion, for an amount of over US$27 billion. The Russian government accused the company of misusing tax havens inside Russia in the 1990s so as to reduce its tax burden; havens were set up by most major oil producers in outlying areas of Russia which had been granted special tax status to assist in their economic development; such "onshore-offshore" were used to evade profit taxes, resulting in Yukos having an effective tax rate of 11%, vs a statutory rate of 30% at the time. Yukos claims its actions were legal at the time and that the company used the same tax optimisation schemes as other Russian oil companies, such as Lukoil, TNK-BP and Sibneft. However, Yukos was the only one to be charged with tax evasion and penalised by the authorities. "Intimidating action by different law-enforcement agencies against Yukos and its business partners and other institutions linked to Mr Khodorkovsky and his associates and the careful preparation of this action in terms of public relations, taken together, give a picture of a co-ordinated attack by the state." This "raises serious issues pertaining to the principle of nullum crimen, nulla poena sine lege laid down in Article 7 of the ECHR and also to the right to the protection of property laid down in Article 1 of the Additional Protocol to the ECHR." "The circumstances of the sale by auction of Yuganskneftegaz to “Baikal Finance Group” and the swift takeover of the latter by state-owned Rosneft raises additional issues related to the protection of property (ECHR, Additional Protocol, Article 1). This concerns both the circumstances of the auction itself, resulting in a price far below the fair market-value, and the way Yukos was forced to sell off its principal asset, by way of trumped-up tax reassessments leading to a total tax burden far exceeding that of Yukos’s competitors, and for 2002 even exceeding Yukos’ total revenue for that year." In the Western media and the Russian opposition media the high-profile arrest of Khodorkovsky is usually attributed to his activism in the Russian political process. On October 31, 2003, shortly after the arrest of the company's CEO, the Russian government froze ownership of 44% of the company's shares. The reason given was to prevent a group of shareholders led by Khodorkovsky from selling a large stake of the company to the US oil firm Exxon. A Yukos shareholders' meeting scheduled for December 20, 2004 was to discuss a "crisis plan." A Russian company must hold such a meeting before it can apply for bankruptcy in Russia. The Russian Government sold Yukos's main production unit, known as Yuganskneftegas, at auction on December 19, 2004 to recover some of US$28 billion in alleged tax debts, following the loss of an appeal by the firm. Menatep, the company representing Khodorkovsky, promised to challenge the sale's legality in a number of countries, and to sue the buyer and any company helping to fund the deal. The expected buyer was the 38% Russian state owned company OAO Gazprom. Some European and American oil firms decided not to bid. On December 19, 2004, the Baikalfinansgrup, an unknown company registered several days before the auction in Tver at an address where a snack bar was located, won the auction for Yukos's subsidiary Yuganskneftegas with a 260.75 billion rubles ($9.4 billion) bid. According to people familiar with the auction[who?] only two bidders registered for, and were present during, the auction process: Baikalfinansgrup and Gazprom's former oil unit Gazpromneft. Accounts from the auction say that the first bid of US$8.6 billion came from Baikal. When the auctioneer asked Gazpromneft to offer its price, a representative of the company asked to make a telephone call and left the room. A few minutes earlier, the auctioneer had told participants that using a mobile phone or leaving the room was against the rules. When a Gazpromneft representative returned to the room, Baikal made a bid of US$9.3 billion. Gazpromneft never placed a bid or spoke out. Shortly after the Yuganskneftegaz auction, Rosneft, Russian state-owned oil company, acquired 100% of shares in Baikalfinansgrup. The acquisition of Yuganskneftegaz significantly increased Rosneft's profits and made it one of the largest oil companies in Russia. On June 15, 2006, based on a bank deposit of $4 million USD and its American CEO's Houston home, Yukos filed for bankruptcy protection in the United States, estimating its assets at US$12.3 billion and its debts at US$30.8 billion, including "alleged taxes owed to the Russian government". It accused the Russian authorities of "an unprecedented campaign of illegal, discriminatory, and disproportionate tax claims escalating into raids and confiscations, culminating in intimidation and arrests". After several weeks of deliberation, the Houston court declared that under no conceivable theory could Yukos assert domicile in the United States. On July 25, 2006, the creditors of Yukos decided to file for bankruptcy after the bankruptcy manager recommended the company be liquidated. By mid-December, 2004, all members of the board of Yukos, and most of the company's senior managers, had left Russia, some of them because of "fear of arrest" after being "summoned for questioning by prosecutors". According to a December 2004 Houston, Texas court filing, the CFO resides in Houston. According to a company spokeswoman the CEO resided in London, UK as of December 2004. Executives Mikhail Brudno and Vladimir Dubov fled to Israel in 2003, and were seen on February 2, 2005 in Washington, D.C. at an official function for President George W. Bush. Both men were cited in an international arrest warrant regarding their involvement in the Yukos tax case. On Wednesday, April 6, 2006, the company's Executive Vice President, Vasily Aleksanyan, was arrested just six days into his new role. Yukos commented on its web site that, "We can only assume that this action against him is a direct result of his accepting a position to work to protect Yukos Oil Company and its legitimate stakeholders." The following month, it was reported that some individuals established themselves as the "New Management" of Yukos. However, this was apparently an illegal act, as Yukos "emphatically rejected" the legitimacy of the "new management" which had Vinokurov as President. According to Yukos, these individuals were "loyal to Rosneft" and had as goal the downfall of Yukos. A Yukos lawyer, Pavel Ivlev, was accused of several crimes,[clarification needed] after which he moved to the USA.[when?] In July 2006, one week before creditors would vote if they should file for bankruptcy, Steven Theede resigned his function as he believed the outcome of this vote was already fixed and therefore this meeting would qualify as a "sham". The Yukos Oil Company's former shareholders and management filed a series of claims in courts and arbitration panels in various countries, seeking compensation for their expropriation. The largest, for over $100 billion, was filed at the Permanent Court of Arbitration in 2007 and resulted in the arbitrators awarding Yukos majority shareholders over USD $50 billion in damages. US and Russian investors, representing about 15 percent and 5 percent of Yukos, respectively, lack the benefit of an investment treaty. The sole remedy of US-based investors in seeking approximately $12 billion in redress is to request the State Department and the Office of the United States Trade Representative to espouse the claim to their Russian counterparts, as it is determined by the Magnitsky Act of 2012; State Department officials have reportedly raised Yukos investors' concerns at deputy prime minister level in the past. The total final award in damages announced by the Permanent Court of Arbitration on July 18, 2014 was some $50 billion. The European Court of Human Rights ruled for Russia to pay the former owners Yukos €1.87 billion ($2.51 billion) in compensation for unfair proceedings of the tax evasion case. Yukos is asking for $333 million to cover losses incurred after its accounts were frozen plus costs and interests. On 20 April 2016 the District Court of The Hague quashed the decisions of the PCA, ruling that it had no jurisdiction as provisional application of the ECT arbitration clause violated Russian law. ^ "Yukos Creditors Told Russian Oil Company Is Doomed". Bloomberg. July 25, 2006. Retrieved 2008-08-31. ^ "Yukos case against Russia begins at European court". BBC News. March 4, 2010. ^ "Russian state oil company wins another Yukos auction". New York Times. August 8, 2007. ^ Council of Europe, Parliamentary Assembly. "Resolution 1418 (2005)". Archived from the original on 2006-11-24. Retrieved April 6, 2010. ^ "Arbitration Institute of the Stockholm Chamber of Commerce: About Us". Archived from the original on 2014-09-27. Retrieved 2014-08-04. ^ "Permanent Court of Arbitration: Final Awards Issued in 3 Arbitrations Between Former Shareholders of Yukos and the Russian Federation" Archived July 29, 2014, at the Wayback Machine, pca-cpa.org; accessed July 30, 2014. ^ "Court orders Russia to pay $50 billion for seizing Yukos assets", reuters.com, July 28, 2014; accessed July 30, 2014. ^ "Energy Charter Treaty: Coming up for 20 years", published 2014, by Norton Rose Fulbright partners and associates Deborah Ruff, Julia Belcher and Charles Golsong. From p.5: "[A]rticle 45 of the ECT required Russia to apply the ECT 'provisionally'. The tribunal found that Russia could not simply apply the ECT piecemeal, and that Russia had – by signing the ECT – agreed that the treaty as a whole would be applied... On 20 August 2009, Russia gave notice that it wished to [withdraw from] the ECT... Russia is, however, still under an obligation (until 19 October 2029) to afford the investment protection under Part III of the ECT to investments made before 19 October 2009 for 20 years." ^ Russia Rejects Energy Charter Treaty: A New Era for Investment Arbitration?, International Law Office, 22 October 2009. ^ "Hague court to rule on $50 billion Russian payout to Yukos shareholders", themoscowtimes.com; accessed July 30, 2014. ^ "Yukos shareholders awarded about $50 billion USD", nytimes.com; July 29, 2014. ^ Hugh Fraser (2004-07-27). "Russia's oligarchs: Their risky routes to riches". BBC News. UK. Retrieved 2010-07-20. Russia's most valuable assets were sold at bargain prices to insiders such as Mr Khodorkovsky.... Menatep bought Russia's second largest oil company, Yukos, for $300m. It also took on $2bn in debts, which made the price more realistic. ^ After Putin's Russia: Past Imperfect, Future Uncertain, ed. Stephen K. Wegren, Dale R. Herspring, chapter by Peter Rutland, p.163: " Most of the first wave of oligarchs was concentrated in the banking sector. [...] Banking was a lucrative business since the banks served as intermediaries reaping profits from Russia’s booming natural resource exports, exploiting the gap between the ruble-denominated domestic economy and the dollar-denominated foreign trade." ^ CORPORATE CONTROL AND GOVERNANCE PRACTICES IN RUSSIA Archived 2014-08-12 at the Wayback Machine - draft paper by Yuko Iji, University College, London, CENTRE FOR THE STUDY OF ECONOMIC & SOCIAL CHANGE IN EUROPE: SCHOOL OF SLAVONIC & EAST EUROPEAN STUDIES, June 2003, ISSN 1476-1734: "Besides, since the dismantling of the state monopoly over foreign trade in 1988, those who had access began to sell abroad practically anything exportable. ", citing Gustafson 1999 (27): "Anyone who could acquire [saleable assets] at controlled domestic prices, and then sell them abroad for dollars, was rich overnight". ^ "Time to Rethink Privatization in Transition Economies?" by John Nellis, pub. in the International Monetary Fund's quarterly magazine (June 1999, vol 36, No. 2). ^ http://www.themoscowtimes.com/people/article/mikhail-khodorkovsky/433772.html Profile of khodorkovsky, Moscow Times, 2011. ^ a b c The Oligarch Who Came in from the Cold, Forbes, 2002-03-18, by Paul Klebnikov. ^ Éric Toussaint (2005). Your money or your life: the tyranny of global finance. Haymarket Books. p. 366. ISBN 978-1-931859-18-9. The Russian oligarchs used brutal and criminal methods like those used by the "robber barons" in the United States at the end of the late nineteenth and early twentieth centuries. ^ Bruce Kapferer (2005). Oligarchs and oligopolies: new formations of global power. Berghahn Books. p. 59. ISBN 978-1-84545-174-5. Using his [Khodororkovsky's] close contact with state officials, as well as illegal methods and violence, he saw his wealth and empire continue to grow until he challenged Putin. ^ "Jail term for Yukos security boss". BBC News. March 30, 2005. Retrieved 2008-08-31. ^ Murky Dealings In Russia's Oil Patch, Bloomberg BusinessWeek, October 19, 2003. ^ "The Yukos Library". The Yukos Library. 2012-06-28. Archived from the original on April 23, 2010. Retrieved 2012-12-13. ^ ""Sprawa Jukosu": przyczyny i konsekwencje | OSW". www.osw.waw.pl. Retrieved 2015-11-10. ^ Library of Congress Open World Program site, loc.gov; accessed August 4, 2014. ^ Yukos profile, washingtonpost.com, July 17, 2004; accessed July 30, 2014. ^ a b c d Valuation of Yukos, atimes.com; accessed July 30, 2014. ^ A $50 Billion Bill for Putin's Aggression, by Leonid Bershidsky, bloombergview.com, July 28, 2014; accessed July 30, 2014. ^  Arrested oil tycoon passed shares to banker The Washington Times, November 2, 2003; accessed January 20, 2015. ^ Parfitt, Tom (December 27, 2010). "WikiLeaks: rule of law in Mikhail Khodorkovsky trial merely 'gloss'". The Guardian. UK. Retrieved December 28, 2010. ^ "Russian businessmen declared prisoners of conscience after convictions are upheld". Amnesty International. Archived from the original on October 13, 2011. Retrieved September 29, 2011. ^ European Court Rules That Khodorkovsky's Rights Were Violated, Radio Free Europe, May 31, 2011. ^ "Russian businessman Mikhail Khodorkovskiy's detention in breach of the Convention' European Court of Human Rights press release May 31, 2011". Scribd.com. Archived from the original on 2015-01-29. Retrieved December 22, 2013. ^ O'Flynn, Kevin (May 31, 2011). "Mikhail Khodorkovsky 'not a political prisoner', Human Rights court rules". The Telegraph. UK. Retrieved April 29, 2013. ^ "Mikhail Khodorkovsky case: European Court faults Russia". BBC. UK. May 31, 2011. Retrieved April 29, 2013. ^ "Russia's trial of oil magnate Khodorkovsky not political, court rules". Guardian. UK. May 31, 2011. Retrieved April 29, 2013. ^ a b Yukos Majority Shareholders Hit a $50 Billion Gusher (registration required), July 28, 2014, by Michael D. Goldhaber, americanlawyer.com; accessed July 30, 2014. ^ Yukos valuation, nytimes.com; accessed July 30, 2014. ^ Valuation of Yukos, washingtonpost.com; accessed July 30, 2014. ^ a b Michael Goldhaber, "A lifetime of litigation - the fall of Yukos", legalweek.com, July 9, 2010; accessed July 30, 2014. ^ "Russian officials draw up a memorandum to the European Court". Kommersant. January 30, 2007. Archived from the original on July 21, 2011. Retrieved July 23, 2010. ^ "Manager of Yukos' "daughter" admitted tax evasion" (in Russian). September 12, 2005. Retrieved 2008-08-31. ^ "Yukos advisers plan lobby offensive". BBC News. 2003-10-31. Retrieved 2012-12-13. ^ "Resolution 1418 (2005): The circumstances surrounding the arrest and prosecution of leading Yukos executives". Council of Europe. January 25, 2005. Archived from the original on July 17, 2011. Retrieved August 31, 2008. ^ "Profile:Mikhail Khodorkovsky". BBC News. June 16, 2004. Retrieved 2005-12-11. ^ Erin E. Arvedlund (July 6, 2004). "Pressure Builds in Kremlin Vs. Oil Giant". New York Times. Retrieved 2005-12-11. ^ Steven Lee Myers; Erin E. Arvedlund (October 28, 2003). "Oil Tycoon's Arrest Scares Russian Markets". New York Times. Retrieved 2005-12-11. ^ "Russia: Just Who Is Baikalfinansgrup?". Radio Free Europe/Radio Liberty. December 20, 2004. Retrieved 2010-08-21. ^ "Yukos oil boosts Rosneft profits". BBC News. February 13, 2006. Retrieved 2010-08-20. ^ a b "Creditors vote to bankrupt Yukos". BBC News. July 25, 2006. Retrieved 2008-08-31. ^ "Yukos Fugitives Feted in U.S." February 4, 2005. Archived from the original on February 6, 2005. ^ "Top Yukos official Aleksanyan detained in Moscow". April 6, 2006. Retrieved 2008-08-31. ^ "YUKOS Lawyer Shows Signs of Three Crimes". Kommersant.com. Archived from the original on 2012-10-28. Retrieved 2012-12-13. ^ Gregory L. White (September 21, 2011), European Rights Court Delivers Split Yukos Ruling(subscription required) Wall Street Journal. ^ Irina Reznik, Henry Meyer and Alex Sazonov (July 14, 2014), Khodorkovsky Partners Turn Hunters as $140 Billion Rulings Near Archived July 28, 2014, at the Wayback Machine Washington Post. ^ Megan Davies and Douglas Busvine (February 12, 2014), With Khodorkovsky out, Yukos investors fight on Reuters. ^ Yukos - GML Background Note Shearman & Sterling. ^ Megan Davies and Douglas Busvine (February 12, 2014), With Khodorkovsky out, Yukos investors fight on, Reuters, February 12, 2014. ^ "Dutch court: Rosneft owes Yukos damages in $333 million suit". Petro Global News. Retrieved 18 February 2015. ^ "Arbitration awards on multi-billion claims against Russia quashed". Rechtspraak.nl. 20 April 2016. Retrieved 25 April 2016. Wikimedia Commons has media related to Yukos. This page was last edited on 6 April 2019, at 17:50 (UTC).